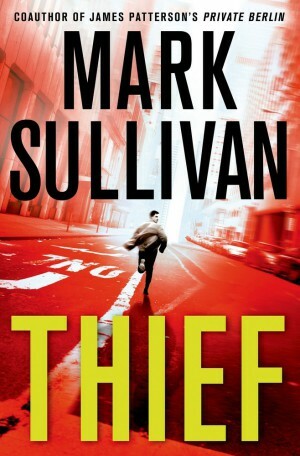 Co-author of Private Berlin and Private L.A. with James Patterson, Mark Sullivan‘s next novel is THIEF. Due to be published on December 16th, 2014 (next week), by Minotaur. It is the third novel featuring Robin Monarch — following Rogue and Outlaw. The series is published in the UK by Quercus Books, and will publish Thief on December 31st in eBook, and January 1st in print. For more details on the series, scroll down to the end of the post. With the help of his team, Monarch breaks into the legendary Christmas party of Beau Arsenault, a shady investor and behind-the-scenes player at the very highest levels of power politics. Arsenault is not above bending or breaking the rules if there’s illicit profit to be made. Monarch has decided that those illicit profits will be better used to take care of orphans and street kids. Using the party as cover to break into Arsenault’s secret vaults, Monarch comes away with two unexpected things. One is a bullet — he gets shot when he’s caught trying to escape with tens of millions of negotiable instruments. The second is a lead on what might be his most audacious exploit ever. A previously undiscovered tribe in South America may well have the secret to the most sought after knowledge in history — that of eternal life. And Robin Monarch must use all his skills — as an operative, as a thief — to keep this secret from falling into the worst possible hands.